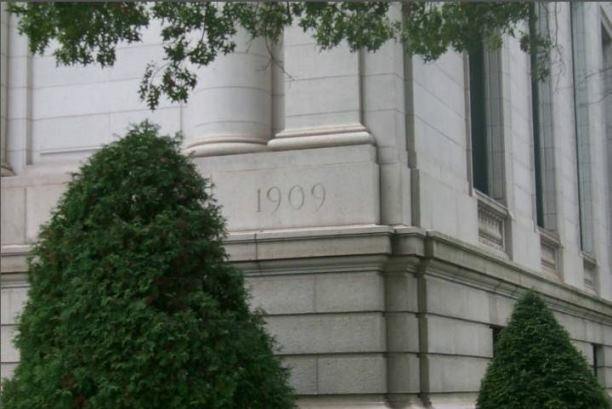 On May 25, 1909, the cornerstone was laid for the new State Library and Supreme Court building in Hartford. It was placed at the northeast corner of the building and is six by six feet long, three feet wide, two feet and four inches high and weighs almost four tons. It contains Connecticut and United States flags, books, photographs, coins, a piece of the Charter Oak, and copies of that day’s Hartford newspapers. The Connecticut State Library is an executive branch agency of the State of Connecticut. It was formed in 1854 when legislation was introduced to the Connecticut General Assembly to form a State Library Committee which hired the first state librarian, J. Hammond Trumbull, who served in the Old State House in Hartford. “A Photographic History of the Connecticut State Library and Supreme Court Building. Part 1: Exterior Construction.” Connecticut State Library, 2014. Link. “A Photographic History of the Connecticut State Library and Supreme Court Building. Part 2: Architectural Details.” Connecticut State Library, 2014. Link. Landscape Architecture Helps in Healing – Who Knew?